Rooney made his senior international debut in 2003 becoming the youngest player to represent England (a record later broken by Theo Walcott). He is England's youngest ever goalscorer.He played at UEFA Euro 2004 and scored four goals, briefly becoming the competition's youngest goalscorer. Rooney featured at the 2006 and 2010 World Cups and is widely regarded as his country's best player. He has won the England Player of the Year award twice, in 2008 and 2009. As of September 2011, he has won 73 international caps and scored 28 goals. Along with David Beckham, Rooney is the most red carded player for England, having been sent off twice. Aged nine, Rooney joined the youth team of Everton, for whom he made his professional debut in 2002. He spent two seasons at the Merseyside club, before moving to Manchester United for £25.6 million in the 2004 summer transfer window. The same year, Rooney acquired the nickname "Wazza". Since then, with Rooney in the team, United have won the Premier League four times, the 2007–08 UEFA Champions League and two League Cups. He also holds two runner-up medals from both the Premier League and the Champions League. 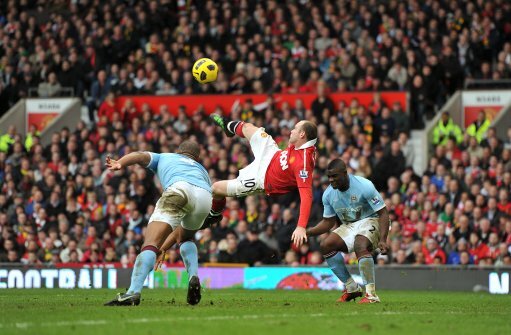 In August of the 2011–12 season Rooney scored his 150th goal, becoming United's highest goalscorer since the inception of the Premier League. In 2009–10, Rooney was awarded the PFA Players' Player of the Year and the FWA Footballer of the Year. Rooney has won the Premier League 'Goal of the Season' award by the BBC's Match of the Day poll on three occasions. He was named in the FIFPro World 11 for 2011. Rooney is the third highest-paid footballer in the world after Lionel Messi and Cristiano Ronaldo, with an annual income of €20.7m (£18m) including sponsorship deals. His later set should have higher ST than his earlier set in my opinion, when he was young he tended to just try and kick it as hard as he could, which led to some spectacular goals but it wasn’t always smart. In his later years he started attempting more curling shots, lobs and chips. Also personally think TMW can be even higher on his later set, it’s often said here that he would have been even better if he was actually more selfish, his insane commitment to being useful for every single second of the game probably led to him being used in a midfield role more often and also the reason his legs were gone by the age of 30. Still, one of my favourite players of all time, such a shame he became a sort of laughing stock because he really was one of the best players in the world for many years. Rooney deserve a proper review, that prime set has some strange values, since i am committed to check Cristiano's early seasons probably i can take an eye on him.